Home sellers who are trying to wait for better days are very wise if they have the staying power, but are going to be greatly disappointed if they must sell a home in the next few years. By measuring the trend of home sellers who choose to not re-enter the market, we can get a feel for the level of unlisted homes for sale that is growing. One interesting statistic that I track on a daily basis is the number of homes that are failing to sell (AND) not re-entering the market. For our long-time readers who know about the shadow inventory, most real estate reports do not consider recently failed home sellers as part of the shadow inventory (but we know better :)). Look at the graph below and you will see that more than 3 homes each day are joining the shadow inventory. Based upon the information seen in the graph above, our one-year trend for this category shows that more than 3 homes each day are leaving the market without being re-listed for sale. 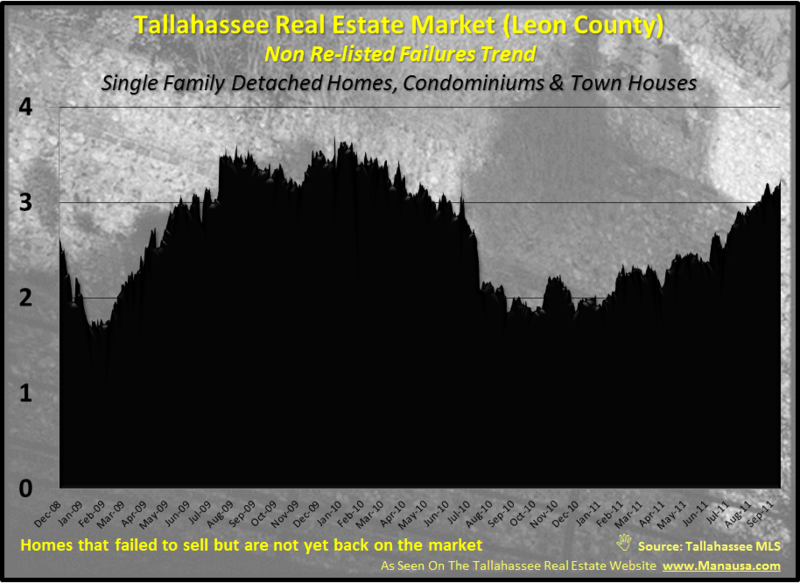 I would bet we can expect to see these sellers back in the market just as soon as they think they can sell, and this is most certainly real estate inventory that nobody is counting towards the current over-supply of homes for sale in Tallahassee.